The gist of Mr. Yoshiro Ito’s memorandum read by Shoji Mitarai,Executive Director: September 20 marked two weeks since the aftemath of two unexpected incidents–September 6 earth quake which ripped through Hokkaido and the electric power failre(black out) in all homes in Hokkaido. These incidents were very much in the news in the entire world. On Sept.20(Thu. ), to heal the wounds and minds of people,including the AJSH’ members, Autumn Evening Jazz Concert was held in Rm Biei at Sapporo Prince Hotel. 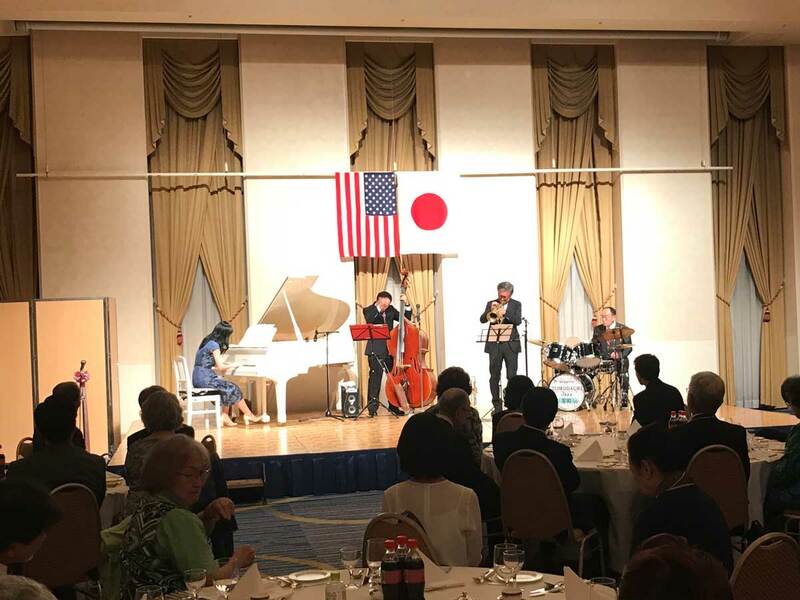 The Sapporo TOMODACHI Jazz Trio–formed by John Ries, the former American Consul General,Sapporo–contibuted and played Autumn Leaves, Bosanoba number Wave and blues My Foolish Heart. The AJSH’s members—Akira Yabi(Bass) Haruno Ogasawara(piano), Shoji Mitarai(on the Drums) and a surprise guest trumpet player also joined the Trio. 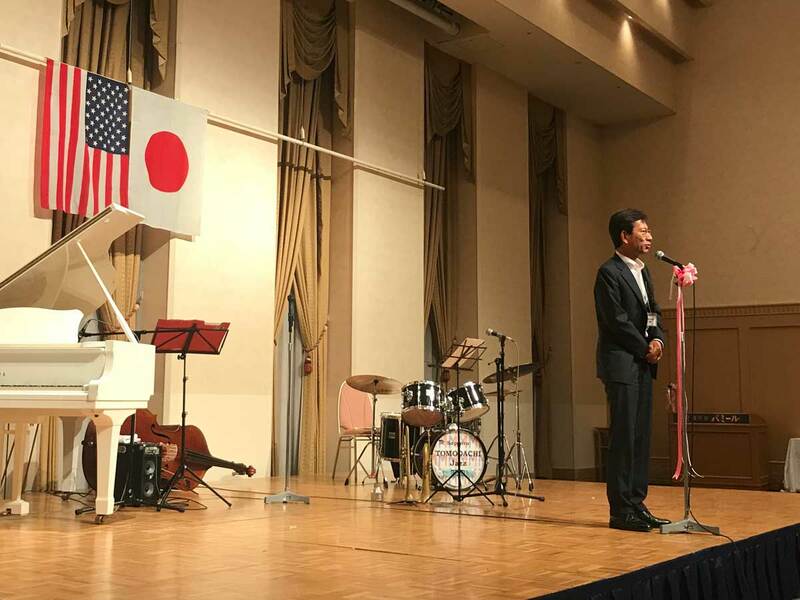 On behalf of President Yoshiro Ito–who flew over to Tokyo out of urgency–Shoji Mitarai,Executive Director read a message paying a trubute not only to those who lost their lives,but also who were affected by the big September 6 earth quake and electric black out as well. While the electricity restored, Mr. Ito wholeheartedly whished a speedy recovery of peoples’ normal lives in every respect and normalization of transportation systems throuout Hokkaido. As Chief of the Hokkao Red Cross, Mr. Ito rushed over to Atsuma town–the most deversted area. He also dipatched rescue operation teams–who brought food items,medicare materals, and, and made a fund-raising campaign. Such friends and associates of ours—-President of NAAJS Ichiro Fujisaki, Mark Davidson, the former Director of Sapporo American Center, Erick Johnston of The Japan Times in Tokyo and Peter Kelley, Chair of NAJAS, Glen Fukushima, a fomer Deputy Assistant at USTR and currently a senior fellow of Center for American Progress, Lenny Yajima, former President of Japan-America Society of Hawaii, and Chair, Kiyoko Morita of Massachusetts-Hokkaido Association in MA also sent us heartfelt symathy messages and condolences. Mr. Kazuhiro Nishijima, Chief Executive pf the Yomiuri Newspaper,Hokkaido Branch made a toast and offered a few words. 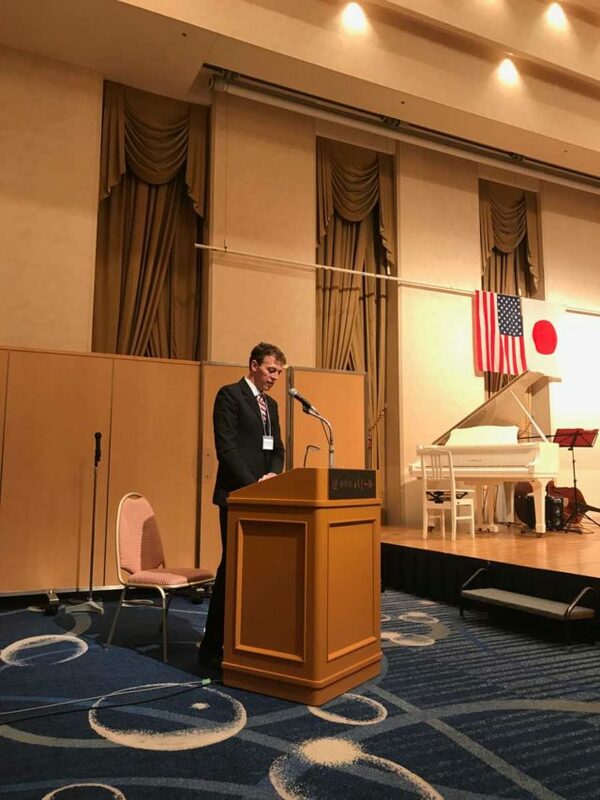 A newly arrived Consul, Mr. Ryan Ingrassia gave a short speech and greetings.